You must try this super satisfying Ciabatta Bread Recipe. Ciabatta refers to a long, flat, airy bread with a thick, crunchy outer crust. Ciabatta bread is available in many varieties, as it is often stuffed with onions, chestnuts, raisins or other ingredients before baking. 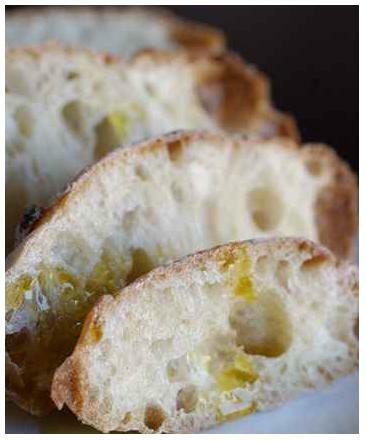 Shown below is a basic recipe for Ciabatta Bread. 1. In a small bowl stir together 1/8 teaspoon of the yeast and 2 tablespoons of warm water. Let stand 5 minutes, or until creamy. 2. Stir together the yeast mixture, 1/3 cup of the water, and 1 cup of bread flour. 3. Stir for several minutes, then cover bowl with plastic wrap. Let stand room temperature for 24 hours. 5. In a small bowl, stir together 1/2 teaspoon yeast, 2 tablespoons warm water, and brown sugar. Let stand 5 minutes, or until creamy. 6. Using an electric mixer, blend together yeast mixture, sponge, 2/3 cup warm water, 2 tablespoons oil, and 2 cups of flour at low speed until flour is just moistened. 7. Add salt and mix until smooth and elastic, about 8 minutes. 8. Scrape dough into an oiled bowl and cover with plastic wrap. 9. Let dough rise at room temperature until doubled, about 90 minutes. 10. Turn dough out onto a well-floured work surface and divide it in half. 11. Transfer each half to a greased baking sheet sprinkled with flour, and form into an oval about 9 inches long. 12. Dimple loaves with floured fingers and dust tops with wholewheat flour. 13. Cover loaves with a dampened kitchen towel, and let rise at room temperature for about 2 hours. 14. Preheat oven to 425 F (220 degrees C). 15. Bake loaves 15-20 minutes, or until light golden brown. 16. Let loaves cool on a wire rack. For more easy, tasty recipes and other popular American favorites, visit any link shown at the bottom of this page. Go here to learn how to Work From Home in All 50 States. Sell your own Designer Plus Size Clothing and more. Go here for a list of Factory Outlet Malls in every state.